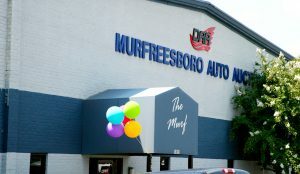 FRANKLIN, Tenn. — Dealers Auto Auction of Murfreesboro celebrated the auction’s 9th anniversary with a promotional event that offered more than 900 vehicles and sold over 450 on Aug. 22. The event also raised money for the Hope Center Ministries and together with their dealers, they raised over $45,000. Hope Center ministries is focused on restoring individuals, families and communities struggling with drug addiction. Through designated phases of support, residents work through the challenges in their lives, deal with root-issues and journey forwards with new found hope. City Auto Finance, a sister company to the Dealers Auto Auction Group, provided drinks, lunch and ice cream to the dealers, and Caprock was the spotlight consignor of the day, offering more than 100 units! Additional units consigned by Emkay Leasing, United Auto Credit, ARI and other national consignors were also offered for the event. A few Titans football cheerleaders were also there to lend support for the event.